Sometimes I would love a sneak peek into Neil Gaiman’s brain just to see how he crafts these Tim Burton-esque tales that take full advantage of the imagination! 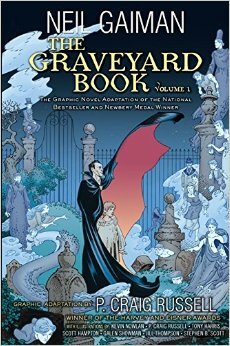 The Graveyard Book is no exception, though I fear too many readers might be tempted to write it off as just a run-of-the-mill ghost story. But this novel is more than the sum of its spooky parts. Yes, it hinges on a murder mystery. Yes, it’s set in a graveyard. Yes, ghosts and paranormal beings take center stage. But this is not a box mix spook tale. 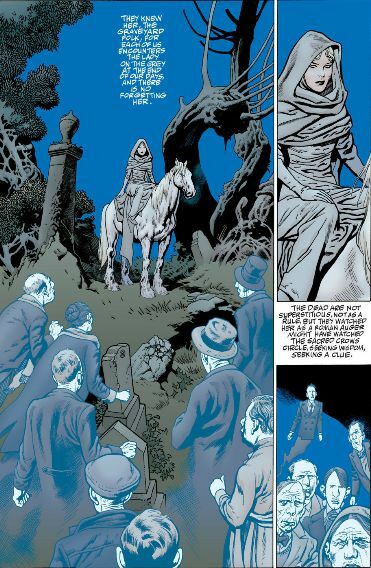 Instead, it’s a novel that ponders life and the path to adulthood – it just uses a graveyard and ghosts to tell it. Story-wise, the novel opens with the aftermath of a brutal murder as a little boy, the sole survivor, toddles to a graveyard. Ultimately deciding that the Dead should show charity, the resident ghosts take him in and raise the lad. 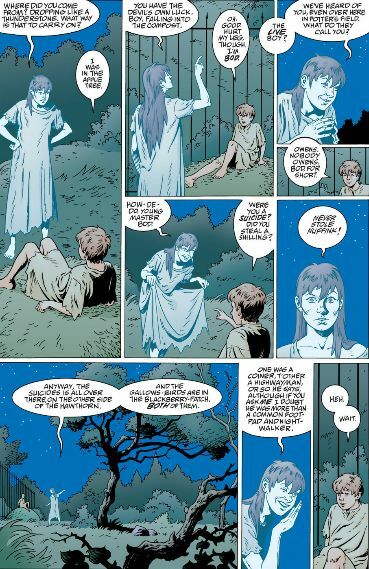 Given the name Nobody Owens, Bod (for short) spends his days learning the ways of the Dead and encountering a plethora of persons, from Silas, the enigmatic figure who assumes guardianship over Bod; to Miss Lupescu, who harbors a powerful secret identity; to the witch Liza Hempstock; to even the foreboding Sleer, which awaits the return of its Master. Each character is given a fair amount of time to develop into a real character, so no one here is just a figure who consumes space on the page. It was difficult for me to select favorites, but if I had to, I would choose Silas, who is a great balance of a kind, wise, old soul and a no-nonsense protector who knows how to treat Bod with a firm hand (though he never becomes abusive or mean). Not to mention that Silas’ identity is a bit of a mystery as he’s not exactly alive but he’s also not one of the Dead. I have read numerous theories, from suggesting Silas is a vampire to claiming that he’s some sort of supernatural guardian, yet the novel never definitively says. But, actually, that’s okay. I don’t mind not being told and it just adds to the depth of Silas’ character. The principle protagonist here is Bod Owens, whom we see grow up to become a young teenager. 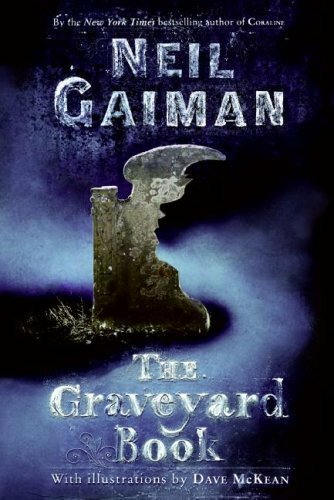 Thus, The Graveyard Books functions as a coming-of-age tale as it showcases a young protagonist who physically and mentally matures throughout the story and learns about himself and the world. However, mercifully this novel does not fall into the typical coming-of-age cliches. Bod eventually meets and befriends Scarlett, a living girl, but they don’t fall into a puppy love romance. Bod doesn’t always see eye-to-eye with his mentors and sometimes hates being confined to the graveyard but he doesn’t try to run away just because he gets miffed and has an “I’ll show them!” moment. And Bod doesn’t grow up overnight: his progression is slow and, over time, he learns more about the outside world, gleans wisdom that enables him to make smart choices, and gains a better appreciation for life itself. Again, as odd as it is to say, this novel is more about life than death. One especially poignant reminder comes from Silas when he tells Bod that being alive means “infinite potential.” “You can do anything, make anything, dream anything,” Silas tells him. “If you can change the world, the world will change. Potential. Once you’re dead, it’s gone. Over. You’ve made what you’ve made, dreamed your dream, written your name….that potential is finished.” I don’t think a novel that seeks to encourage readers about the potential they have with their lives would have worked quite so well without this blatant contrast with death. All the while, despite the ghosts’ best efforts, there is only so much they can accomplish. They can only teach Bod – they can’t proverbially hold his hand and help him along. In a way, their dilemma reminds me of the similar situation Jacob Marley’s ghost finds himself in when he admits that he and his fellow ghosts can only observe the sufferings and goings-on of mankind but are unable to help despite their best efforts (see Dickens’ A Christmas Carol). From a metaphorical standpoint, ghosts are the perfect lens through which to explore the concept of personal legacy as well as wasted potential. The ghost and ghostly beings in The Graveyard Book are aware of the affairs of the living yet remain nearly helpless to effectively intervene. I say “nearly” because some of the graveyard’s denizens are not so confined by Death’s snare, namely Silas and another character who I won’t mention as that probably counts as a spoiler. Thus, not only is this novel about a little boy growing up into a young teen, it’s also about the ghosts seeing the impact they have made on the world, for better or worse, and how they attempt to exact some degree of influence beyond the grave. Plot-wise, the novel focuses on Bod as he grows up in the graveyard, which involves him learning from ghostly mentors, witnessing paranormal horrors and wonders, and garnering some rather nifty paranormal skills such as the ability to Fade. However, the man, Jack, who destroyed his family remains at large, thus Jack becomes the central villain though his presence isn’t heavy-handed. While the ultimate reason for Jack’s targeting Bod’s family – as well as his villainous connections – might seem a little too convenient for the story’s sake, it’s not so out there or unbelievable that you care to dismiss it. In the end, Jack’s fate is carried out well and Bod gets a satisfying conclusion to his rather strange story. 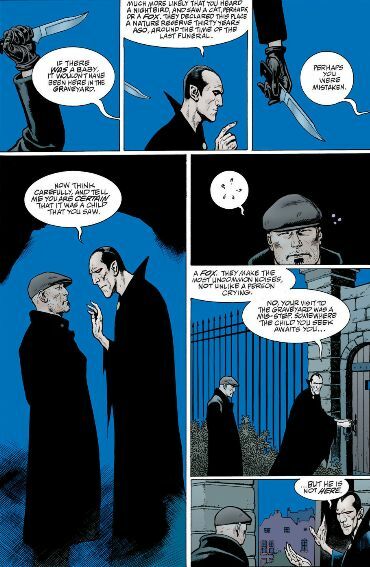 In closing, I felt it was worth discussing, in brief, the graphic novel adaptation. In a nutshell, if you loved the original novel, you’ll enjoy this, too, as it’s interesting to see artists’ renderings of the various ghostly characters. Personally, I loved how they depicted Silas, whose exact nature in the novel remains veiled (though readers have theories as to what type of being he is). However, here, it’s fairly clear Silas gets the – shall we say – Transylvania treatment, which all but eliminates doubt over his true nature. I enjoyed this take on his character and, seeing as he was one of my favorite characters from the novel, it only adds to my appreciation of his mysterious aura, which is retained here to some degree. It was also fascinating seeing how other figures and places, as well as the thrilling ending, get depicted here. Likewise, we see more action here as well as moments outside of the cemetery, and I thought the way these scenes were rendered was true to the novel while still very imaginary. 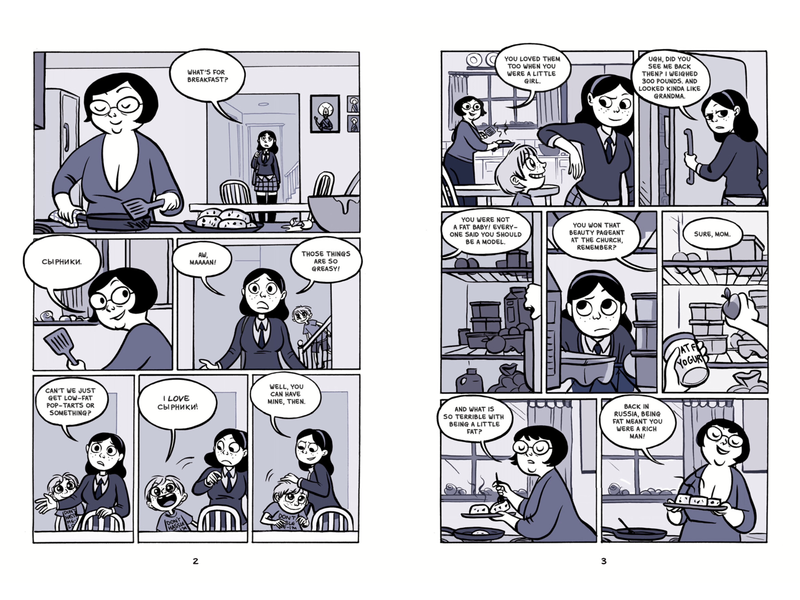 However, it’s worth noting that the graphic novel is actually split into two volumes. 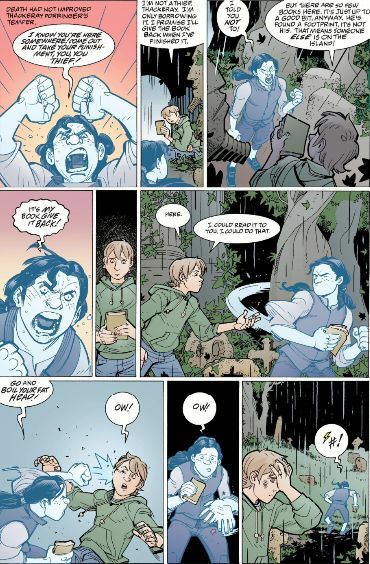 So rather than have a graphic novel version of the original novel in full, this adaptation is divided into two parts, which might seem jarring for readers whether they’re familiar with the original book or not. Likewise, the graphic novel version, as to be expected, is simply a condensed version of the original story, so some of the more introspective moments contained there are either abridged or omitted here. 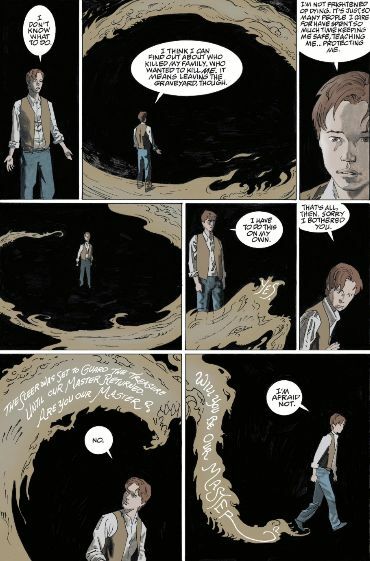 I suppose I will never fully convert to being a graphic novel lover, but this treatment of a Gaiman gem is certainly nothing to pass by or sniff at, especially if you loved the original. 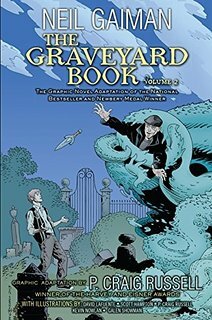 Overall, The Graveyard Book is a masterpiece that deserves to be read by all ages and discussed for its graceful treatment of life, death, and growing up. While the novel comes shy of providing concrete answers, it succeeds and excels at serving up great food for thought throughout its spooky backdrop. I’m generally not a fan of the macabre when it’s morbid for morbidity’s sake, but this novel doesn’t travel that road. It’s central setting might be a cemetery, but it only uses that image to teach Bod (and readers) about the value of life and the legacy we leave behind.